Sure Start Children’s Centres are places where children under 5 years old and their families can receive seamless holistic integrated services and information, and where they can access help from multi-disciplinary teams of professionals. 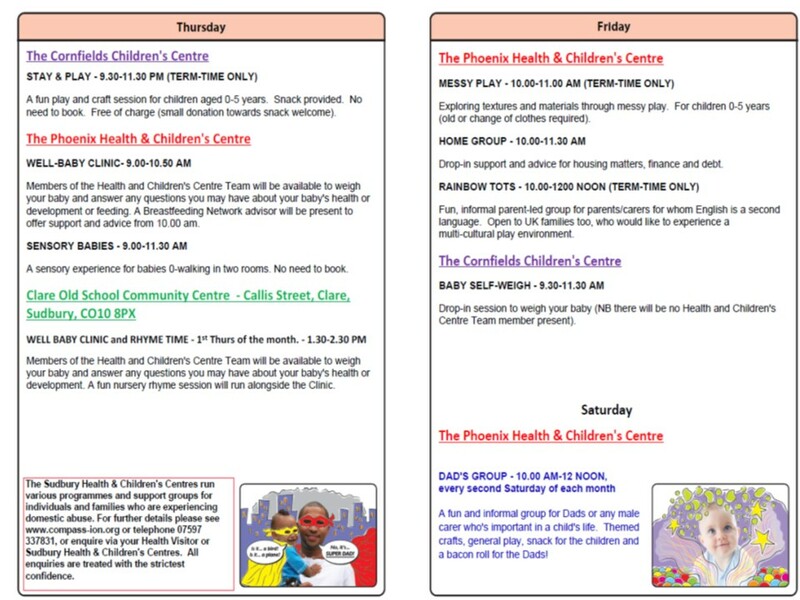 Children's Centre Services include: Early learning and childcare. Effective links with Jobcentre Plus. A base for childminders to meet. 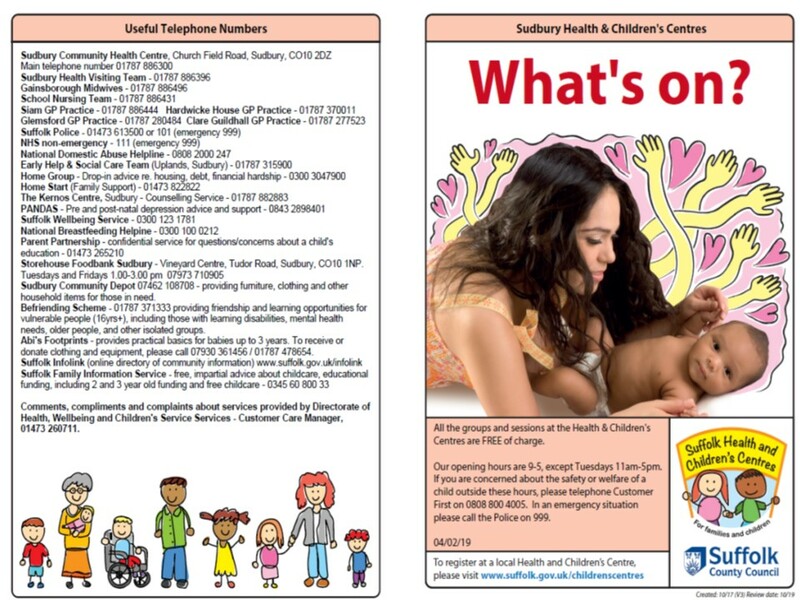 Child and family health services. Support for children and parents with special needs. Family support and parental outreach services. 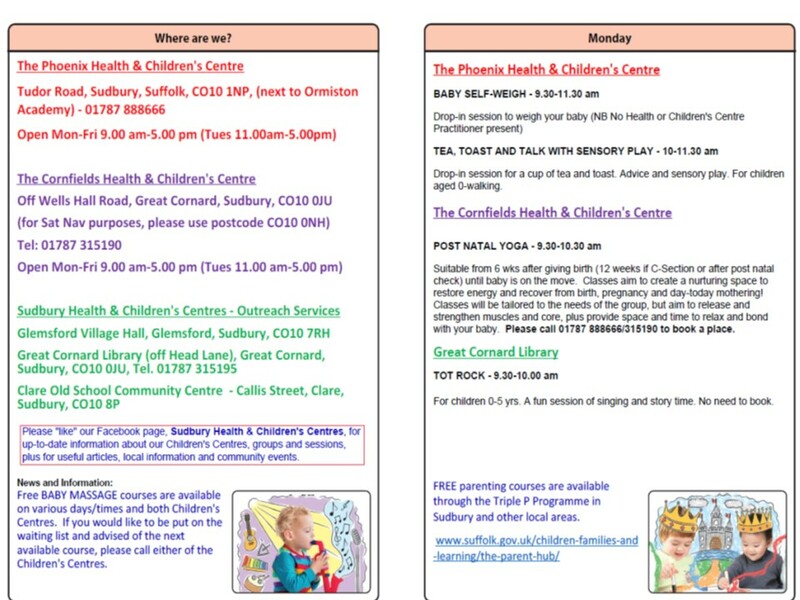 Children's Centres are for families with children under five. 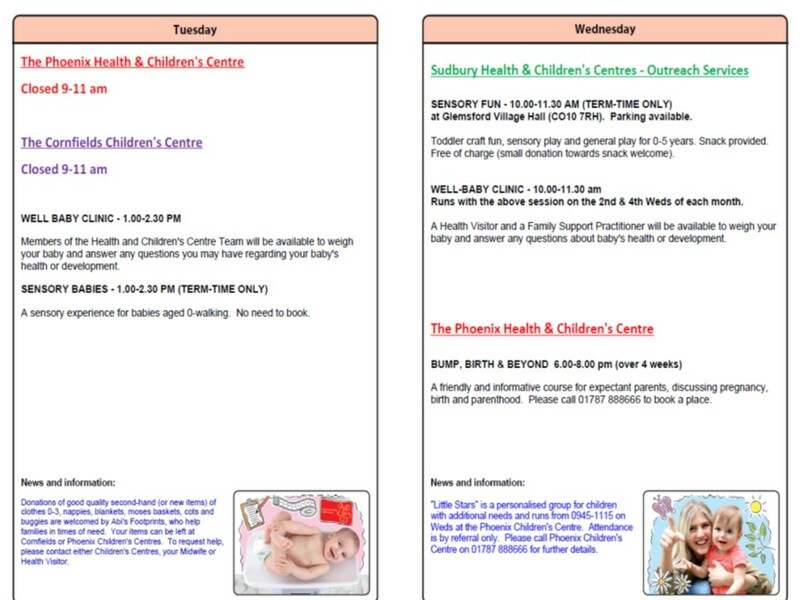 In Suffolk we have joined up our Children’s Centre’s with the Health Visiting service, as we believe this will provide you with the best care and support. The Children's Centre teams are made up of Health Visitors, Family Support Practitioners and Support and Information officers. At Cornfields Children’s Centre, we are committed to promoting and providing high quality learning and play opportunities. We believe in valuing and respecting each individual in a welcoming, accessible and inclusive environment. The centre has an equal opportunity policy which is reviewed as a minimum yearly. We offer a range of universal and targeted support and services which are designed to meet the needs of all users. Where possible, all our group activities are planned to meet individual children’s needs. We work within the Revised Early Years Foundation Stage framework, and will capture evidence of your child’s progress as she/he attends the centre. Play sessions will offer activities which can be arranged on different heights including floor level and we can adapt sessions to meet individual’s needs. All our toys and equipment are suitable for children aged 0 to 5 years and we have a range of specialist resources, including sensory equipment. How will staff support my child's needs? Staff are on hand during our activities and can offer help and support as required. One-to-one support is available for families in the home and we will work in partnership with you and other agencies in meeting your family’s and child’s individual needs. Your child is at the heart of our service, and should you require additional help, we will work with you to help identify any areas of concern, ensuring your child’s wishes and feelings are at the centre of the support. We are trained to use the Common Assessment Framework to ensure that we are able to undertake a good assessment of your child’s needs, recognising and building on their strengths. When it’s time for your child to start attending nursery or school, we can support you the transition period as we know this can be both challenging and an emotional time. Together, we can develop a transition passport which will help ensure that there is a smooth transition for you and your child. What arrangements are in place to ensure that Cornfields Children’s Centre is accessible for children and families with special educational needs and/or disability? The site has disabled parking spaces outside the front entrance. Access to Cornfields can be by steps or ramp and this applies to both front and rear entrances. Our outdoor play areas are all at ground level and consist of some concreted areas, softer outdoor flooring and grassed areas. The garden has a mixture of high and low level beds, where children can dig, plant and watch things grow. Within the centres we have accessible toilets with baby change facilities which include emergency alarms and all internal doors are wider to allow easy access. The furniture within the centre is entirely moveable and adaptable allowing us the flexibility of creating and moving spaces if required. All resources and equipment are displayed at child-height, and are fully accessible, allowing children to make independent choices about their play. What training or experience do the staff supporting children and young people with SEND have?